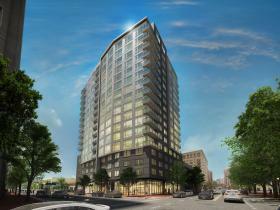 Plans have been filed that would bring the city's second location of Target to Ivy City. Douglas Development filed an application with the Board of Zoning Adjustment (BZA) that seeks a special exception to bring large-format retail to the nearly two-acre site along New York Avenue between 16th Street and the private Walt Lincoln Way NE (map). BZA approval would enable the developer to construct a 1-2 story commercial building on the site anchored by Target. Designed by Bignell Watkins Hasser Architects, the building will rise two stories on the northwest corner and will also have 148 parking spaces on a below-grade level. 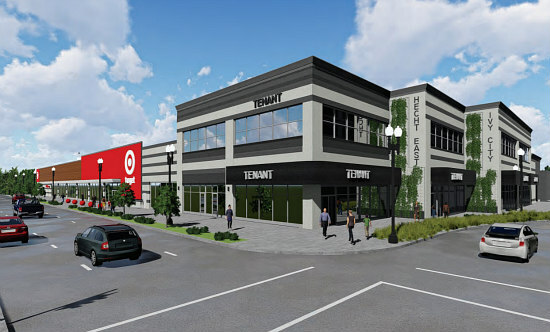 The building will have up to five retail tenants, with Target taking up 67,106 square feet of ground-floor space. The remaining 8,089 square feet on the ground floor will be split between three smaller tenants; a fourth tenant will occupy 12,062 square feet on the second floor, accessible via a lobby on the ground floor. No zoning hearing has been scheduled as of yet.